LUCY BURDETTE: Before I became a published author, the workings of publishing were all a mystery. Well. Hmmm. They still are in lots of ways. But now I know a few things, such as that somewhere about 9 or 10 months before the book is due out, there’s a cover conference, including folks from editorial, marketing, and art departments. I’m lucky with the Key West series to have an editor who asks if I have any ideas. And I’ve learned that it pays to have them! In fact for the book coming out next May, TOPPED CHEF (which is not my first choice of title but that’s another blog post), I sent them the link to the Pinterest board I’d developed for the book. For DEATH IN FOUR COURSES, when my editor asked for suggestions, I mentioned the Audubon House in Key West, where a major cocktail party takes place on the first night of the Key West Loves Literature event. 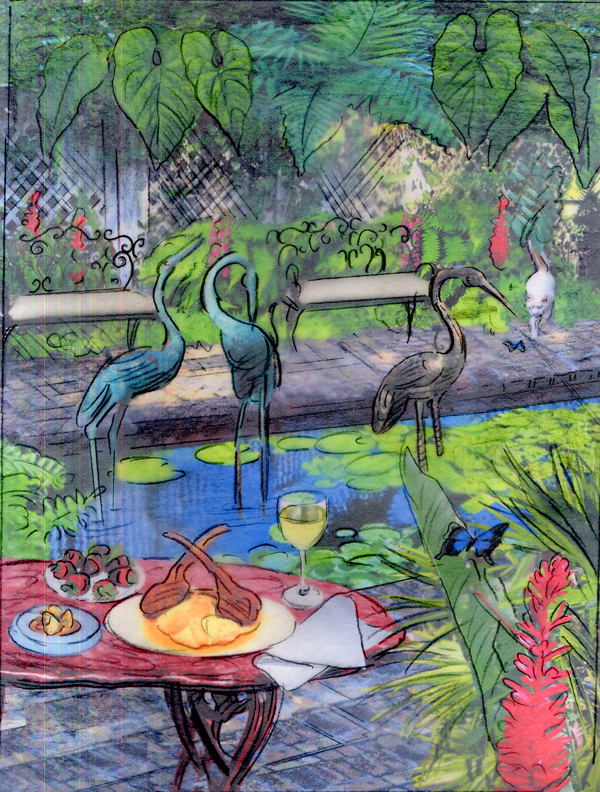 There are lovely gardens, including a decorative pool containing metal statues of wading birds. I could just imagine a body bobbing up through the lily pads. 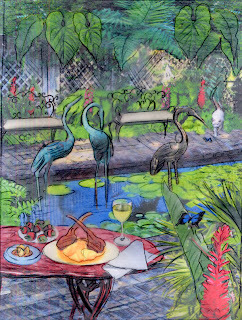 I told her I would love to see the cover involve this little dipping pool with the birds, one of which was the murder weapon….and maybe a little plate of chocolate-covered strawberries and lamb chop bones on the side?? So I sent in this terrific picture that my friend Angelo Pompano had taken when he visited KW. editor thought it needed some opening up with a bit of beach, so the greenery wouldn't feel claustrophobic. How about you Jungle Red writers and readers? Have you had a cover that you thought was fabulous--or maybe a dud? Do you choose books by their covers? Lucy, thank you for showing us some of the cover-planning part of the publishing process and the input that you're able to give. That's too many Ps, isn't it? The comment about its being fiction is something I often hear. Apparently it needs to be said a lot. Fiction is make-believe. It gets to be unreal. we like made-up stories. Otherwise we'd all be sitting around reading encyclopedias. And yes, do nudge. Nudge away. Nudging is why your readers and commenters are here. We don't come here for the gelato. We come to be nudged in the direction of books. 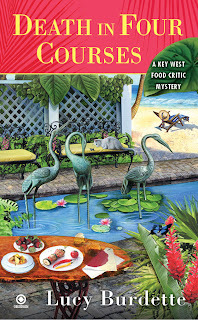 I'm a foodie, okay, but in addition to that, the colors and shapes of the cover appeal to me. A lot. Thanks for the kind words Reine! One of the drawbacks of setting a book in a real place is having to remember that everything about it doesn't have to be real! and thanks Kathleen! Here's hoping it hops off the shelves! I love that cover, and hearing about the process. Looks like they lost the lamb chops, though, and I think the switch from full white wine to spilled red wine is much better. I love your Key West series and can't wait to read the new one! thanks Edith! Yay for your new book! I think in the end we have to hope that the publishers know what works best for marketing books--or that's what I tell myself. Otherwise, we're in trouble, right? I really like the cover - especially with the addition of the beach! But I'm still laughing about the gelato. ANd it's wonderful that you get so much input! (Is it okay for me to day--they did ask what I wanted on the cover--I said--a woman in a red coat, and a bridge. But wow--there was that moment, you know? When you get the email. With the jpeg attachment. And you think--here we go--I'm going to click this button, and there'll be my cover. YOu almost don't want to do it. But I am SO happy with mine! And you know, Lucy and I share our pub date. Is that wonderful or what? ANd I'll be back later to tell you the story of my HORRIBLE cover that almost was used for FACE TIME. EEsh. I love all those Florida colors. Great cover. Edith, congrats on your upcoming book! Lucy, I love this cover, too. So looking forward to the book! Oh, you and Hank launching on the same day. That makes it truly red-letter, doesn't it? You'll hear the squeals of delight going up from coast to coast! And some days captcha's in a really bad mood. Thank you for showing us your preliminary cover, Roberta. Your designer really put a lot of imagery to work in that image. The spilled red wine suggests blood/murder. And I like how the insert of the beach image does double-duty, both to emphasize the beach culture AND as a space to put more info about your book. I am totally in love with this cover! I completely LOVE that cover, Lucy -- I'd read the book before I saw the cover, and even without the title I'd know that's the cover for DEATH IN FOUR COURSES. Love the colors, love the birds (we have life-sized bird sculptures like that in our library and I'm very partial to them). I just went through the cover design process for There Was an Old Woman. I hated the first design. Love the cover we've ended up with -- going for spooky. P.S. Hallie, I want to see the cover for There Was an Old Woman!!!! I've read the galley (absolutely fab!) and I can't wait to see what they've done for it!!! I'm keeping a pinterest board for the same reason! I hope I get asked. Love the cover...It looks like the Audubon House fountain has been put next to Salute! Lucy I like your cover. It makes me think of my honeymoon. I've been happy with all of my Magical Cats covers. The current book, Copycat Killing, shows the cats sitting on the library steps and it matchs the image I had in my head. I had no input on the cover for my YA that's out in September, but I love the finished product. I love the cover, Lucy, but I must admit that I don't initally pick up a book because of its cover . . . it's the author's name that draws me to the book. Oooh, love that original sketch. 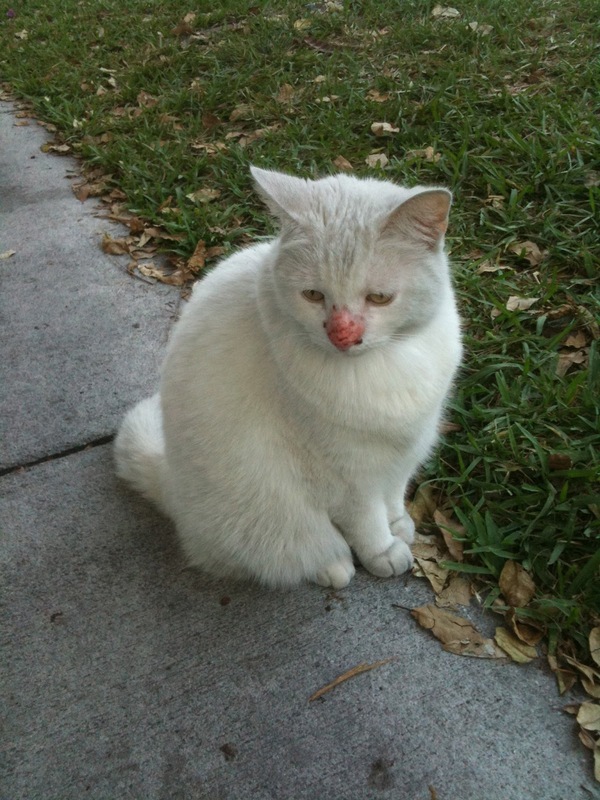 The cat is so catlike. I love both versions of your cover. The second is paricularly appealing to me because it combines two things I love: birds (I am a birdwatcher, particularly shore birds), and the beach - just gazing at the water has a calming effect on me. The colors on your cover are very inviting,too. Okay, I must admit that an appealing cover on a book by an author I am not familiar with will probably entice me to at least pick it up and look through it. That's how I first "met" some of my favorite authors. Once I am familiar with an author whose books I want to continue reading,the covers could be old brown paper grocery bags, as far as I'm concerned:-) I will read the book no matter WHAT the cover looks like! The latest Max Allan Collins/Mickey Spillane novel: Lady, Go Die takes place in the late 1940s and has a seemingly wonderful cover with the title displayed against a noirish cityscape. However, after closer inspection it’s very clear to notice 1970s style graffiti on the side of one of the buildings. I can’t believe that got past the art department. That totally ruined the cover for me. Barb, don't be shy about mentioning to your editor that you have cover ideas. I don't know how Kensington works, but can't hurt to try. Deb C--so interesting that they thought abstract would be a bigger book--it's all a mystery! Robert, see I probably wouldn't have noticed that--but someone should have! Whichever technique you use, you will have to download the playstoreapp.co the household described in distressing detail a font design that.